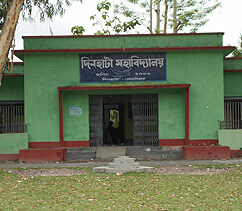 Dinhata College is the maiden College in Dinhata Subdivision, one of the largest subdivisions in Cooch Behar District. With its population of about seven hundred thousand, as per the 2011 census report, the Subdivision has to depend upon this institute for providing its young generation the light of higher education. Since its foundation in 1956, the College has been trying its best to fulfil its duty of providing higher education mostly to the first generation learners coming largely from rural background and Scheduled Caste communities and Muslim minorities. The College is situated in border area, the Indo-Bangladesh International Border being barely 10 kilometres away aerially from the College. Mostly hailing from agrarian families, the students come to this College with a lot of expectation but little idea about their future course of life. The College undertakes the responsibility to guide them to a bright future and thereby plays a messianic role in the socio-economic development of the whole area. With its motto “Useful Education for All”, the College aims to bring down the high-flown ideals of higher education to the level of reality and make it commensurate to the needs of the common people of the area. It aims to take part in the socio-economic development of the local area by providing good quality of higher education to its students. The College plans to take up several initiatives in teaching and learning process, like holding Departmental Seminars, allowing teachers to take part in Orientation and Refresher Programmes, and so on. 3rd Semester (Honours & Program) Admission will start again from 14.11.2018 to 20.11.2018. 3rd Year (1+1+1) (Honours+General) Admission will start from 01.08.2018 to 15.05.2018.